March 18. Welcome, to this week&apos;s newsletter. 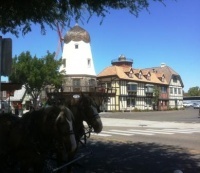 If you have every dreamed of retiring in California&apos;s beautiful wine country, Solvang could fit the bill. This lovely town, the setting for parts of the movie "Sideways", was established by Danish settlers. Several single members have asked us to encourage others in that situation to share where they intend to retire, and why. So here goes, please let us know your thoughts, plans, and experiences. When it comes to retirement, it is not that easy being single. A recent survey of retirement preparation and financial literacy produced an average score of 20%, and no one got an A. So we have prepared our own little (easier) 11 point quiz to let you find out for yourself - just how prepared are you? Warning: in the survey mentioned, most folks thought they had done a good job!